Home > Europe > 1800 Europa in de gedaante eener zittende dame. 1800 Europa in de gedaante eener zittende dame. 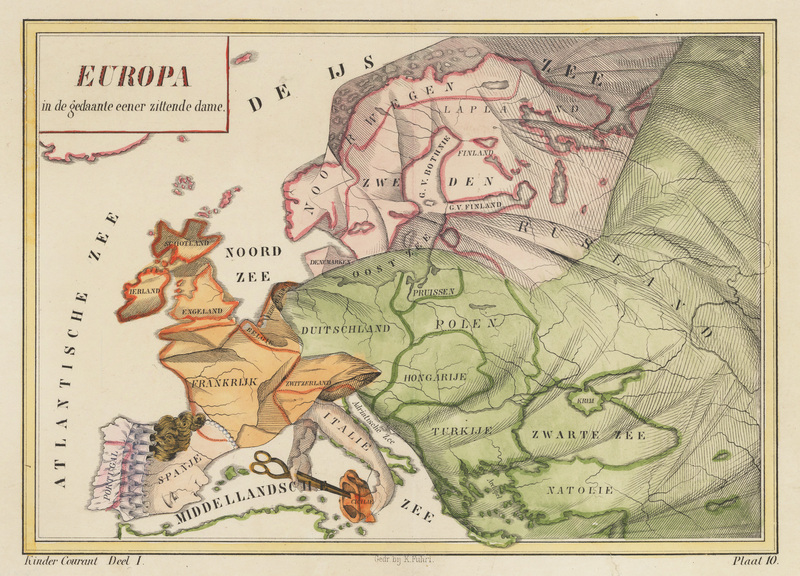 This highly unusual map depicts Europe as a satirical female figure whose head and face are Spain and whose caplet is Portugal. Italy forms her left arm holding a cup (Sicily) which she is stirring with a pair of scissors held in her right hand, which is formed by Corsica and Sardinia. Britain serves as her scarf while her flowing dress denotes the remainder of the continent. It follows the tradition of depicting Europe as a regal queen but differs from others in that it is an anti-Napoleonic version, demoting Europa from a queen to a middle-aged housewife. The figure is superimposed over a map which shows political boundaries of the day. The map was based on a similar one by Francois Bohn, circa 1794. Condition: This marvelous hand colored map is on watermarked paper with a strong impression. It is in A condition.